THE PROTECTED DISCLOSURE made by former garda press officer Superintendent David Taylor “is essentially a work of fiction”, lawyers for An Garda Síochana have told the Disclosures Tribunal. Shane Murphy SC was speaking during his closing submission to the tribunal, which is examining allegations from Taylor that he was directed to brief negatively against garda whistleblower Sergeant Maurice McCabe. “There is no substantiated evidence that Mr Callinan or Ms O’Sullivan instructed or directed any such effort on Superintendent Taylor’s part to malign Sergeant McCabe, or that either were aware of any such effort,” Murphy told Justice Peter Charlton, the tribunal chairman. Murphy said that Superintendent Taylor’s 2016 protected disclosure was “essentially a work of fiction”, and the chairman should find that the allegations that Superintendent Taylor was directed to negatively brief against Sergeant McCabe were untrue. “We say that such a finding, if made, will serve the public interest in establishing how a mere allegation can become the received truth at enormous cost to the individuals involved and at enormous cost to our society,” Murphy said. “It will also serve the public interest in at least partially addressing the substantial harm to the reputation and professional standing of former commissioner Callinan and former commissioner O’Sullivan,” Murphy said. Murphy said that the tribunal had shown the ease with which allegations of misconduct could gain public traction, but a different picture emerged when they were tested in evidence under oath. “What has emerged from the evidence is a very different picture to what was contained in the allegations in the protected disclosure,” Murphy said. Murphy said that Superintendent Taylor’s credibility was “effectively shattered”. Counsel said that the existence of a rumour in 2014 did not of itself ground an inference that it must have been spread in a deliberate way by Superintendent Taylor, and some journalists said they heard rumours as early as 2011 before Superintendent Taylor became press officer. Murphy said that Superintendent Taylor was upset, angry and bitter at being moved from his role in the garda press office. Meanwhile, a barrister representing RTÉ told the Disclosures Tribunal that Superintendent Taylor’s account of his dealings with journalists was “unworthy of trust”. Both journalists deny allegations made by Taylor that he negatively briefed them about McCabe. Gillane said nobody had pointed to a syllable of Burke’s journalism to suggest he was party to any alleged smear campaign of McCabe, and reports by Reynolds about McCabe were “a textbook example of journalism at work”. Gillane said that email records showed that there were extensive editorial discussions before broadcast about the contents of news reports Reynolds made on a leaked copy of the findings of the O’Higgins Commission of investigation. The O’Higgins Commission looked at complaints made by McCabe about policing in the Cavan-Monaghan district. Gillane submitted that there was no evidence of any external interference or briefings in relation to the reports from Garda HQ. Gillane also said there was no reason why journalist Philip Boucher-Hayes would make up an encounter with former commissioner Martin Callinan. The journalist said that before a Crimeline programme in December 2013, Callinan told him McCabe had done “the worst kind of things”. Counsel said that Boucher-Hayes had volunteered his evidence after the chairman called on anyone with information to come forward, and had reported to colleagues what Callinan had told him shortly after the event occurred. 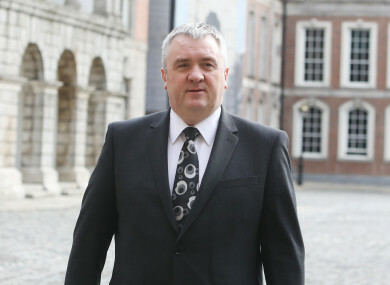 Earlier, Darren Lehane BL said that the meeting between Boucher Hayes and Callinan was relevant to his client, John McGuinness TD, as it showed a pattern of behaviour. Lehane said the tribunal chairman was entitled to consider the evidence of other witnesses about encounters they had with Callinan on 24 January 2014. In particular, Lehane referred to a brief meeting between Callinan and comptroller and auditor general Seamus McCarthy. McGuinness told the tribunal that on 23 January 2014 after a Public Accounts Committee (PAC) meeting, Callinan told him McCabe “fiddles with kids”. McGuinness said that at a meeting in a Dublin hotel car park the following day, Callinan also said that there were investigations into abuse allegations against McCabe. Lehane said that the fact that similar remarks were reported by Seamus McCarthy, the comptroller and auditor general, showed a pattern of behaviour by Callinan. Callinan was “desperate” to stop McCabe before appearing at the PAC, Lehane said. He submitted his client, McGuinness’s, evidence was supported by a near-contemporaneous note he made after the meeting, and by similar accounts of meetings given by other witnesses. The barrister said that Callinan’s claims that two witnesses would raise the same issue in an identical manner, that he would would respond in a near identical manner, and never make a record of those “unusual” conversations anywhere were not credible. Lehane said his other client, journalist Ann Harris, was subjected to attacks on her character and threatened with defamation proceedings and suggestions she was motivated by bitterness or a grudge. Michael O’Higgins SC, on behalf of David Taylor, said that of 12 journalists his client had nominated who would support his evidence, 10had “confirmed in stark terms they did not receive any such briefings, and two of the journalists weren’t willing to comment”. Taylor claims that he was directed to negatively brief journalists about McCabe by Commissioner Callinan, and that his deputy Nóirín O’Sullivan was aware of the direction. Both former commissioners deny the allegations. O’Higgins said that it was either “an incredible coincidence” or there was something to Taylor’s evidence, as it matched closely the evidence of other witnesses about what they alleged Callinan said to them. “If he was a fantasist who just wanted to throw a spanner in the works, he was a very fortunate fantasist and he was a very lucky spanner thrower,” O’Higgins said. O’Higgins said that the tribunal could conclude that Taylor and Callinan “were working in tandem, rather than separately and in ignorance of each other”. He said that Taylor did “bear an animus” to O’Sullivan, and had incorrectly believed she was a driving force behind his arrest and attempts to discredit him during an investigation into garda leaks. O’Higgins said that Taylor’s evidence was capable of being believed, and it was up to the chairman to decide if it should be believed. Submissions continue tomorrow with Murphy, followed by barristers for Independent News & Media and Sergeant McCabe. Email “Protected disclosure made by David Taylor 'essentially a work of fiction', lawyers for gardaí tell Tribunal”. Feedback on “Protected disclosure made by David Taylor 'essentially a work of fiction', lawyers for gardaí tell Tribunal”.